Despite the skittish weather, it was summer in Sunapee last Sunday, as Pete Merrigan made his first public appearance since returning from Florida. He’d played for invited guests at a Friday gathering in New London, and what he jokingly called a “private performance” at the Newport Moose on Saturday, but the afternoon show on Digby’s outdoor deck was the first chance most area fans had to enjoy Merrigan’s easygoing music since last fall. 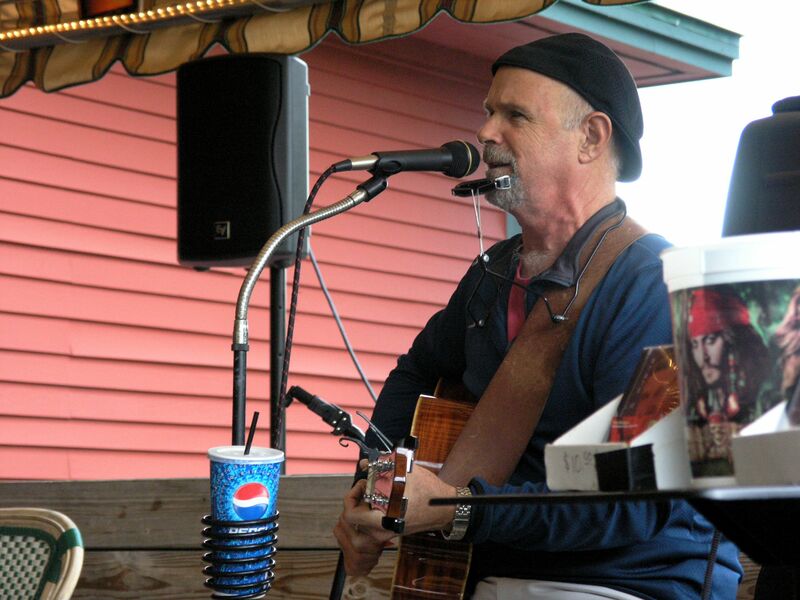 With his trademark beret and microphone stand cup holder, he ambled through a set of songs that included originals from his Mad Beach Band days, and cover tunes as recent as the Plain White T’s “Hey Delilah.” Always the crowd pleaser, he did plenty of requests, usually the moment patrons called for them – “sure, I’ll do Margaritaville” – and bantered with the crowd throughout. The singer-guitarist has a busy calendar in the months ahead, including Newport’s Salt Hill this Friday, Sophie & Zeke’s June 13, Bistro Nouveau June 20, along with a regular Thursday gig at Shorty’s in Manchester. He resumes an annual tradition July 4, when the Lake Sunapee All-Stars perform at the harbor fireworks show – something they’ll do again in August. Merrigan has area shows scheduled all the way to November, which begs the question – what of “Three Season Pete,” who typically arrives in late spring, stays through summer, and leaves in early fall for St, Petersburg? He’ll travel south for the right gig, like the recent Mad Beach Band reunion, part of a five-band outdoor concert that drew, by some estimates, ten thousand fans. But after four years in Florida (and two before that wintering in the islands), Merrigan is happy to be heading home. Though he’s added a few new cover songs to his repertoire, he hasn’t written any of his own for a while. Since I grew up in a California city with four different high schools, the idea of Alumni Weekend seemed quaint when I came to Claremont in 1980. I’ve come to realize just how important it is to the local community: a chance to renew old ties and catch up on life’s changes. Every June, regardless of time or distance, Claremont is once again home. The focal point is, of course, Saturday’s annual Alumni Day parade. Graduates from as far back as 1930 ride in vintage cars and often astounding floats – this year’s theme is “Our Beautiful Parks” – that represent weeks, even months of planning and preparation. Adding to the pomp and circumstance is a new VIP viewing stand, stationed in front of Hullabaloo, that allows past teachers and honored guests to watch as marching bands and reveler-filled flatbed trucks pass in review. Rain or shine, it’s an event not to be missed. On Saturday, there’s dancing in the streets as well, with local rockers the Rhythm Junkies holding forth downtown from noon until three. Pleasant Street will be bustling with food booths, while Broad Street Park will have plenty of activities for kids, including a clown and a giant slide. Later that night there’s a banquet at the Stevens gym, and then a Moose Lodge performance by Stan Jr., a Derry, New Hampshire singer with a knack for stringing together several decades’ worth of tunes, punctuated with a Las Vegas showman’s gift for gab. As is Alumni Weekend, without fail; Stevens, it’s been noted many times, has the longest-running, continuously active high school alumni effort in the country. That’s due to hard work and a durable community fabric – and, of course, Cardinal Pride. Thursday: Farmer’s Market, Claremont – A TV nutritionist recently explained that French people stay skinny and live longer lives because they eat real food. Whole grains, fresh fruit and vegetables, not the kind of stuff you pick up at the drive-through window. This weekly merchant gathering provides a bevy of locally grown produce, along with crafts and yes, music. The Sugar River String Band performs, with different talent promised through autumn. Friday: Oneside, Salt Hill Pub – This Boston-based band makes stops at Charlestown’s Heritage Tavern (the next is July 14), but I caught them first at Lebanon’s pub on the green. They combine elements of Dave Matthews Band with Bela Fleck’s spirited musical flights, along with a few southern accents. Check out “Got To Go” on their MySpace site. Ian Knox redefines that banjo as an electric instrument. Plus, you can dance to it. Saturday: Shana Morrison, Ascutney Resort – The apple doesn’t fall far from the tree, as Van’s daughter returns for a brief (two date) Eastern tour. She played the Crow’s Nest last winter to a sold-out crowd. The sight lines left a lot to be desired, so with any luck they’ll relocate the music to a bigger room. Shana mixes her dad’s gems (she sat in during Van the Man’s 2006 tour) with some fine originals. The dreamy, Worcester-based Curtain Society backed her last time out. Sunday: Pete Merrigan, Murphy’s – Pete’s back and he’s everywhere – Sophie & Zeke’s tomorrow, New London’s Snyder’s College Cafe on Saturday and Sunday at this Sunapee eatery, a favorite Merrigan haunt for years. It’s been gussied up, with a new chef and menu. Bleu cheese crusted filet and a Mont Blanc white chocolate raspberry pyramid are among the new items on the menu. But you can stick with margaritas, chips and salsa – nobody will mind. Monday: Molly Venter, Canoe Club – After Marko the Magician goes from table to table like most Monday nights, this New Haven-born singer/songwriter debuts at the Canoe. Judging from the songs on her MySpace page, she has the lyrical sensibilities of Ani DiFranco (“I have trouble relating/when I’m self-medicating”) and a soaring voice that reminds me a bit of Jann Arden. Wednesday: Albert Hammond Jr., Pearl Street – The force behind indie darlings the Strokes made a solo album that shows he learned a thing or two from his father, who wrote “It Never Rains In Southern California.” Junior’s “Yours To Keep” isn’t bubble gum pop, but it’s got more sheen than most post-punk.